An unexpected abundance of Lyman-alpha emission in the Hubble Ultra Deep Field (HUDF) region was discovered by an international team of astronomers using the MUSE instrument on ESO's Very Large Telescope (VLT. 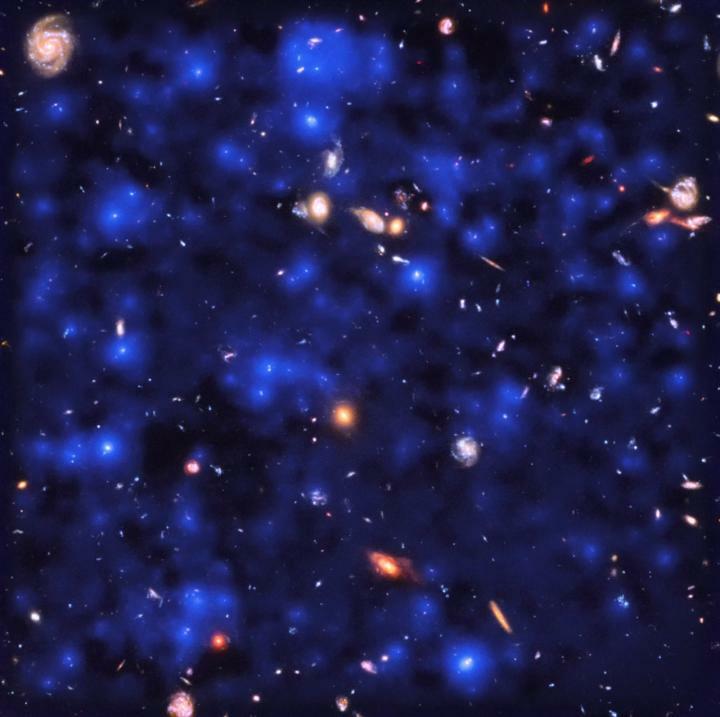 The discovered emission covers nearly the entire field of view — leading the team to extrapolate that almost all of the sky is invisibly glowing with Lyman-alpha emission from the early Universe . MUSE, the instrument behind these latest observations, is a state-of-the-art integral field spectrograph installed on Unit Telescope 4 of the VLT at ESO's Paranal Observatory . When MUSE observes the sky, it sees the distribution of wavelengths in the light striking every pixel in its detector. Looking at the full spectrum of light from astronomical objects provides us with deep insights into the astrophysical processes occurring in the Universe . Unit Telescope 4 of the VLT, Yepun, hosts a suite of exceptional scientific instruments and technologically advanced systems, including the Adaptive Optics Facility , which was recently awarded the 2018 Paul F. Forman Team Engineering Excellence Award by the American Optical Society. The Lyman-alpha radiation that MUSE observed originates from atomic electron transitions – in hydrogen atoms which radiate light with a wavelength of around 122 nanometres. As such, this radiation is fully absorbed by the Earth's atmosphere. Only red-shifted Lyman-alpha emission from extremely distant galaxies has a long enough wavelength to pass through Earth's atmosphere unimpeded and be detected using ESO's ground-based telescopes. This research was presented in a paper titled "Nearly 100% of the sky is covered by Lyman-α emission around high redshift galaxies" which was published today in the journal Nature. The team is composed of Lutz Wisotzki (Leibniz-Institut für Astrophysik Potsdam, Germany), Roland Bacon (CRAL – CNRS, Université Claude Bernard Lyon 1, ENS de Lyon, Université de Lyon, France), Jarle Brinchmann (Universiteit Leiden, the Netherlands; Instituto de Astrofísica e Ciências do Espaço, Universidade do Porto, Portugal), Sebastiano Cantalupo (ETH Zürich, Switzerland), Philipp Richter (Universität Potsdam, Germany), Joop Schaye (Universiteit Leiden, the Netherlands), Kasper B. Schmidt (Leibniz-Institut für Astrophysik Potsdam, Germany), Tanya Urrutia (Leibniz-Institut für Astrophysik Potsdam, Germany), Peter M. Weilbacher (Leibniz-Institut für Astrophysik Potsdam, Germany), Mohammad Akhlaghi (CRAL – CNRS, Université Claude Bernard Lyon 1, ENS de Lyon, Université de Lyon, France), Nicolas Bouché (Université de Toulouse, France), Thierry Contini (Université de Toulouse, France), Bruno Guiderdoni (CRAL – CNRS, Université Claude Bernard Lyon 1, ENS de Lyon, L'Université de Lyon, France), Edmund C. Herenz (Stockholms universitet, Sweden), Hanae Inami (L'Université de Lyon, France), Josephine Kerutt (Leibniz-Institut für Astrophysik Potsdam, Germany), Floriane Leclercq (CRAL – CNRS, Université Claude Bernard Lyon 1, ENS de Lyon,L'Université de Lyon, France), Raffaella A. Marino (ETH Zürich, Switzerland), Michael Maseda (Universiteit Leiden, the Netherlands), Ana Monreal-Ibero (Instituto Astrofísica de Canarias, Spain; Universidad de La Laguna, Spain), Themiya Nanayakkara (Universiteit Leiden, the Netherlands), Johan Richard (CRAL – CNRS, Université Claude Bernard Lyon 1, ENS de Lyon,L'Université de Lyon, France), Rikke Saust (Leibniz-Institut für Astrophysik Potsdam, Germany), Matthias Steinmetz (Leibniz-Institut für Astrophysik Potsdam, Germany), and Martin Wendt (Universität Potsdam, Germany).